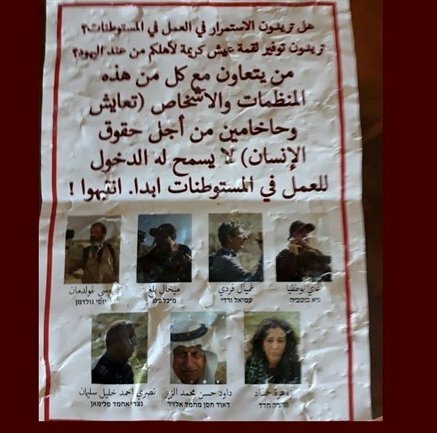 The residents of Tekoa village, near Jenin in the northern part of the West Bank, were shocked to find placards posted around their village on Sunday by Israeli military settlers threatening their livelihoods if they associated with members of Israeli and international peace groups. The placards included a ‘hit list’ of photos of some of the leaders of the organizations in question, which include Rabbis for Human Rights, and the Popular Committee Against the Wall and Settlements. The statement also included a caveat that if residents worked with or talked to lawyers to secure their legal rights to their land, they would be targeted by the paramilitary colonial settlers. The posters stated that if any residents of the area choose to associate with any of the listed people or organizations, they would never be able to work again in the Israeli settlements in the area. The publications included pictures of a member of the National Council and the Central Council of Fatah, Sheikh Dawood al-Zair, human rights lawyers and Nasri Suleiman, a member of the municipality of Janata responsible for monitoring the land threatened with confiscation. A member of the National Council of Fatah, and one of those listed on the poster, Sheikh Dawood al-Zair, told Ma’an News Agency that in recent weeks, the municipality of Janata, along with Palestinian officials including himself, had told residents of the village that they could go to their farmland for plowing and planting – despite numerous recent threats from the paramilitary Israeli settlers attempting to take over Palestinian land in the area. He said that several days ago he himself went to plow his land near Nokdim settlement. The Israeli paramilitary settlers attacked him and the other farmers with him, and forced them to stop plowing on their land. The Israeli army intervened and told the villagers to stop plowing and to leave the land. Al-Zair pointed out that the Israeli settlers have engaged in violent seizure of land in that area, and have used force to illegally annex Palestinian farmland to their settlements and illegal outposts constructed over the last several years in the area. He called on the Palestinian citizens to go to their land and farm as they do every year at this time, stressing his readiness and the readiness of official Palestinian bodies to stand by their side and provide them with everything that facilitates their access to their land and plowing and planting. Farmers and land owners appealed to the authorities to help them reach their land permanently, stressing that they are ready to pay all they have to reclaim their land, where they are facing continual Israeli settler attacks. In recent years, the Israeli occupation authorities have begun to build dozens of houses between the settlements of Nikodim and Taku’a on the land of the residents of Al Aqaban area, east of Bethlehem, within the framework of a plan to create a geographical settlement by connecting five settlement outposts and three existing settlements Gush Etzion East. For his part, the mayor of Jenin, Ziad Ali said that the municipality coordinates through the lawyers to facilitate the access of residents of East Bethlehem to their land and plowing, but recently there is no response by the occupation authorities to coordinate access to land. He added that there is a slowdown in the granting of coordination by the so-called “Civil Administration” of the Israeli occupation army, and even if such permission is granted by the occupying Israeli army, Palestinian citizens who receive permits are often surprised upon arrival to their land by attacks by settlers, and no presence of the Israeli military. The occupation government announced in the middle of last year that they would be adding 500 settlement units in the settlement outpost “Dad”, located on land owned by Palestinians near Mount Fradis east of Bethlehem. The representative of the popular Committee Against the Wall and Settlements in Bethlehem, Hassan Brigieh, said that the Israeli occupation has resorted to the expansion of illegal settlements in order to further divide the West Bank by creating a “settlement belt” on land that the Israeli government considers “wilderness” east of Hebron and south of Bethlehem. None of the land in question is “wilderness”, however. It is all owned by Palestinian landowners and is farmland and olive groves, not wilderness. This Israeli policy aims to impose the siege through a separation belt between the Dead Sea (East Jerusalem) and the areas east of Hebron and Bethlehem (south) and Jerusalem to divide and destroy the West Bank, where over 3 million Palestinians live.